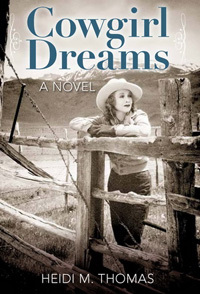 In FOLLOW THE DREAM author Heidi M. Thomas takes us back some 80 or so years ago to the life and experiences of Nettie Moser. The main character, based on the author’s own grandmother, is living the life so many of that time (and even of our own) long for: the right mate and the right place to pursue her own dreams. As is the lot of all of us, though, life comes with its own challenges that will cause Nettie to question the life she is pursuing and at times it seems as though her doubt will affect her husband Jake’s outlook as well. There is an interesting dialogue, both spoken and unspoken that the author brings with Nettie and Jake that I think all of us can appreciate. When it seems that Nettie, who has been so adamant about doing things her way and playing by her own rules, seems to question the logic of moving forward, her husband says this: “I don’t want our world to change. We have to fight to hang on to it.” How many of us haven’t felt that same way when things are going in a different direction than what we had planned? It is with scenes and realism like this that makes Thomas a beloved author that gets to the heart of her characters and by extension her readers. FOLLOW THE DREAM is a call to action not just for Nettie and Jake but all of us as we try to hold on to our own. When Nettie and Jake married they became partners. They would follow the rodeo tours and win the top prizes making names for themselves. Nettie was even offered a chance to show off her riding abilities, both horse and steer, in England when some of her friends decided to take the show across the waters. But then the unexpected hit. Nettie was pregnant, which not only stopped her from touring but it also stopped her from riding. It also meant that she and Jake must settle down and start thinking about their future. Work in the 1920s and 1930s had become rather hard to find but Jake knew there would always be a demand for work horses so he and Nettie decided that breeding and selling their draft horses would be the perfect source of income. That was before the big drought hit resulting in them searching for “greener pastures” and the promise of eventually coming back to their families and buying their own ranch. As I read Follow the Dream I couldn’t help but think about the times of today. Our financial futures and/or lack of them. Follow the Dream has made me realize just how strong our families of the past had to be. The hardships they went through just to get us where we are today. And with each generation, we seemed to weaken just a bit. We have become soft in our tolerance of problems and pain. I don’t believe I know of a person who would go through the hardships that Nettie, Jake and their son Neil went through and still keep a family together. Follow the Dream is a wonderful, heartwarming story of love, not just of a family, but a love for life. The sequel to Cowgirl Dreams, both are suitable for adult and young adult readers. What was great about the Great Depression? In a Montana style story of the Great Depression and one family’s survival, Heidi M. Thomas has written a sequel to her first novel, “Cowgirl Dreams” and has answered this question in a beautifully detailed way. Nettie Moser’s story is the continued tale of the author’s own grandmother. The combined historical aspect and the family connection all set against the harsh backdrop of Montana is carefully crafted. The story is a realistic account of the lonely life of families on farms raising horses, cows and crops in a time when the weather determined the outcome of their efforts. Most of us have images of cowboys in the wild west. This can be an unreal image where Heidi’s book shows how women had to work side by side come hell or high water with their men and children. It was a rough and tumble world but Nettie still holds on to her dream of being in the Rodeo although it almost slips away. Nettie’s love for her husband, Jake, and her son, Neil, is vivid in good times and bad. The family makes choices that are hard but they do overcome their difficulties. I highly recommend this book, especially ideal for young adult readers. To my great surprise this one was a scorcher; I am going to say that right off the bat. I want to get right to the synopsis so I can give my thoughts on this afterwards; I think it will make more sense that way. 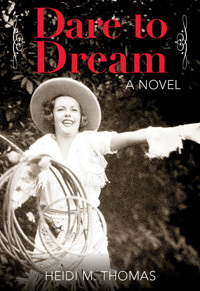 “Defying family and social pressure, Nettie Brady bucks 1920s convention with her dream of becoming a rodeo star. That means competing with men, and cowgirls who ride the rodeo circuit are considered loose women. Addicted to the thrill of pitting her strength and wits against a half-ton steer in a rodeo, Nettie exchanges skirts for pants, rides with her brothers on their Montana ranch, and competes in neighborhood rodeos. Broken bones, killer influenza, flash floods, and family hardship team up to keep Nettie from her dreams. Then she meets a young neighbor cowboy who rides broncs and raises rodeo stock. Will this be Nettie’s ticket to freedom and happiness? Will her rodeo dreams come true? I think this is a great novel for just about anyone. The history of the times, the hardships, the self-sacrifice, trying to break thresholds and cross boundaries, all that is rolled into one here in Cowgirl Dreams . One does not have to have daughters, a wife or girlfriend to even begin to understand and relate to this novel, the plotline is that good. Heidi Thomas crafts several strong and engaging characters. I was transfixed and in awe of her ability to get me so emotionally attached to a group of cowpokes.–Giovanni Gelati, Gelati’s Scoop. This is the second novel written by Heidi M. Thomas that is loosely based on her Montana grandmother who grew up riding horses and competing in local rodeos. 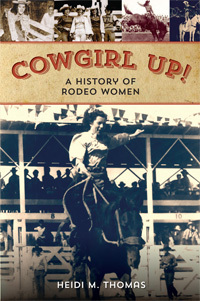 In the book, Nettie’s childhood dream is to become a successful rodeo rider like her dear friend Marie. 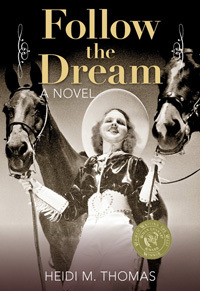 Follow The Dream begins when Nettie is invited by Marie to compete in a wild west rodeo in London, a chance of a lifetime. But fate has another plan for the newly married Nettie. 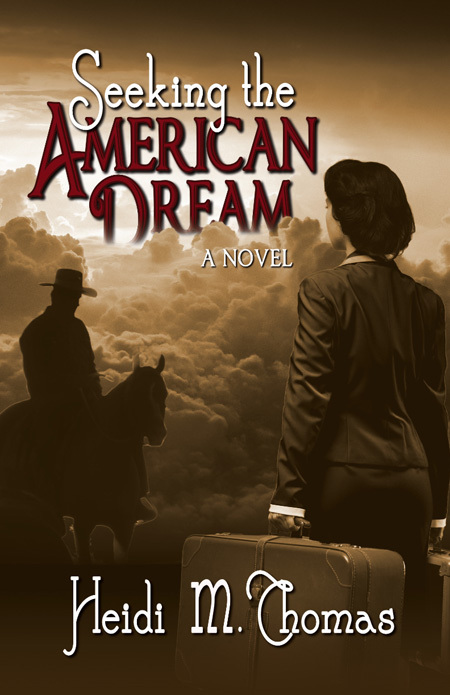 The dream is put on hold, but never forgotten The story is set in Montana in the 20s and 30s. Nettie struggles with personal tragedy and the challenges of getting by raising horses with her husband. They face many droughts and blizzards, let alone the harsh realities of surviving in isolated rural settings. This book deserves a place on the bookshelf next to Ivan Doig’s coming of age in Montana novels. “I enjoyed this bittersweet novel with its accurate depiction of the lives of cowgirls in 1920s Montana and its tender portrait of a marriage.” Mary Clearman Blew, award-winning author of Jackalope Dreams, All but the Waltz: A Memoir of Five Generations in the Life of a Montana Family, and Balsamroot: A Memoir. In her poignant tale of Nettie Moser’s diligent pursuit of a dream, Heidi Thomas gives a stunning example of what it means to “Cowgirl Up.” FOLLOW THE DREAM is a dynamic story of a woman’s strength and determination that is sure to inspire as well as entertain. I’ll ride this steer, show my folks how good I am. Soon after you read; “Uh, yeah. How’d I get here?” That’s the beginning of a wistful story of a cowgirl getting ready for a rodeo. Women in the rodeo in the twenties and thirties were rare, but Heidi Thomas found some real cowgirls and built a wonderful story around them. She had enough material to write two books so far and I suspect we’re just seeing the beginning from this young lady. It helps to have a friend of the same gender in the business and luckily, Nettie does. Starting out in the bull riding business tends to leave a lot of bruises and more time eating dust than staying on top. But to rise to the top you get back on and go again. Nettie was persistent and wanted to be the best. The question for readers is, how far can she go and how far did she actually go? Pick up a copy of this most delightful read and find out for yourself. I recommend this for all readers who love a good story.